The old rubber nosing on these steps were worn and had split where the traffic was high. This caused a safety risk to those using the stairs. When the bridge linking two corporate buildings was added, the owners had the steps built in an attractive curve. To manage the curved line, rubber nosing was used to add grip to the stairs. Over time the rubber wore, started cracking and split making it dangerous to use the steps. 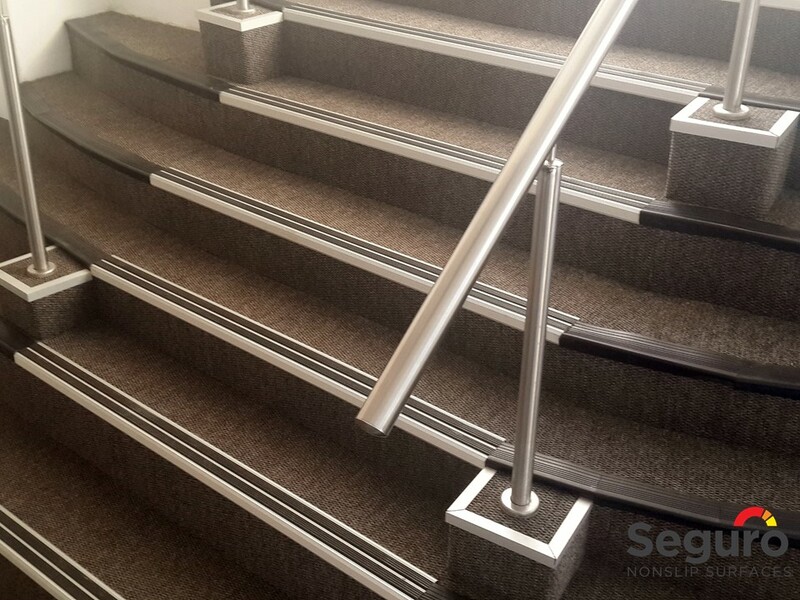 Seguro Nonslip Surfaces recommended installing double aluminium stair nosing. The product is durable and safer than the rubber nosing. However, the curve in the steps posed a problem. We had to straighten the steps between the hand rails where the traffic was. The sides of the steps would remain curved. The area was not used and this would mean maintaining the attractive curved design. The steps were stripped down to the concrete. The necessary adjustments were made to the steps. New carpet was put down and the new aluminium nosing installed. New rubber nosing was used to trim the curved sides of the steps to finish off the look.